I opened it up, and noticed little squares of chocolate making up a rather large bar. Pale white/beige in color, but as I broke off a square there were a bunch of pinkish-red spots within the chocolate- alas! The strawberries! I broke off a piece and ate it. Mmmmmm. 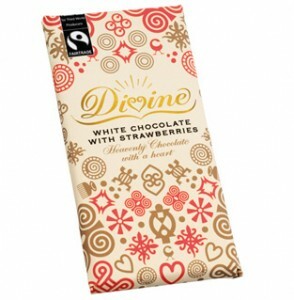 Honestly, even if you don’t like white chocolate, I think you’ll like this. Why? Because- it doesn’t even taste like white chocolate- it tastes like STRAWBERRY ICE CREAM! Immediately when I tried it I thought of strawberry icecream, with vanilla undertones. Creamy and sweet, with just the slightest bit of texture from the peices of strawberries. Just absolutely delicious. This is getting 5 stars from me. Hands down the best white chocolate I have ever had. It’s not the healthiest thing to eat given the high calorie and fat content, but it’s a ver indulgent and very delicious chocolate. I’ll take this for my Holiday treat! 10 blocks (42 grams) is 220 calories, 12 grams of fat (8 saturated), 25 grams of carbohydrates, 24 grams of sugar, and 3 grams of protein.